I am one happy person to know this as well. I love that it is even possible to do this. 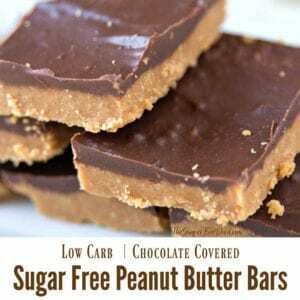 Giving up yummy treats, such as certain coated chocolate candies…. is something that low ‘carbers’ have had to deal with. However, this recipe is doable, which makes someone like myself happy. The secret to the success of this recipe is substituting a few key ingredients. 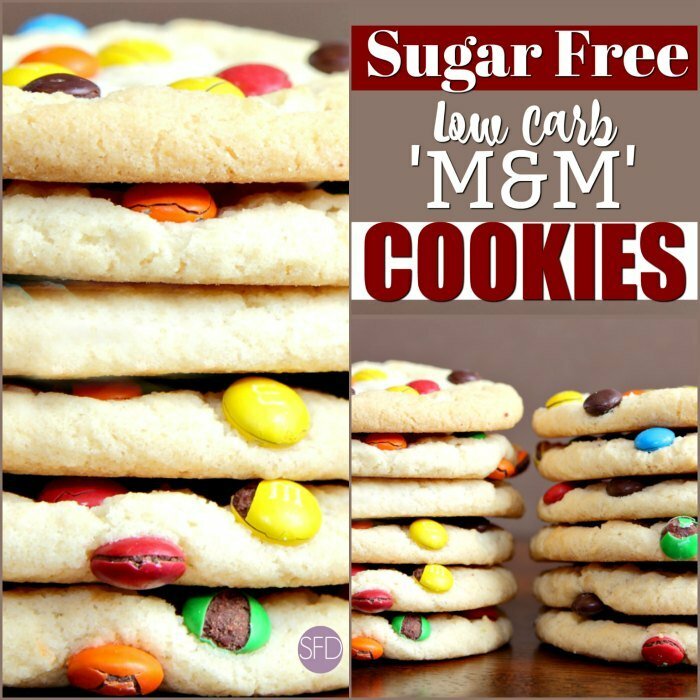 Since this is a sugar free recipe, you will need to use a sugar alternative. 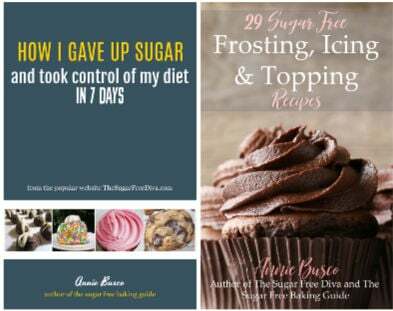 I would suggest a granular sugar alternative that is 1:1 with sugar when used in a recipe. Splenda Granular is one example of this. There are a couple more needed ingredients. You will also need a low carb flour alternative such as my choice, low carb Carbalose flour . Lastly, the candy that you will need. 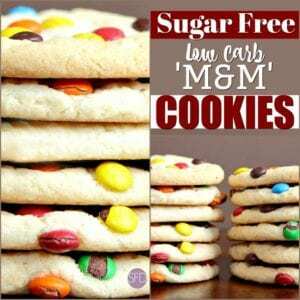 Atkins make a good low carb M & M candy alternative to the regular sugared candy. Also, check out these similar recipes. Let me start by mentioning how much I hate to see candy coated cookies such as this one that have bled into the cookie itself. I like to refrigerate or freeze my candy before adding it to the batter in an attempt to prevent this issue. Substitute these flour alternatives for the all purpose flour. low carb Carbalose or a gluten free flour. Butter- 2 sticks plus 1 tablespoon softened to room temperature. 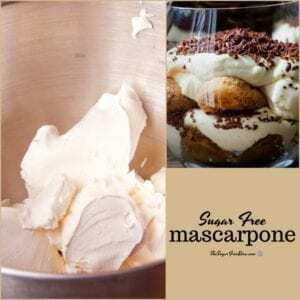 Sugar alternative- granular 1:1 to sugar in volume works best for this recipe. Use the equivalent to 1 1/2 cups of sugar. Vanilla Extract- 2 1/2 teaspoons. Preheat your oven to 350 and prep your pan(s) for nonstick. I use parchment paper or a silicon mat. In a mixing bowl, blend together the butter and the sugar alternative. Add the eggs, one at a time, and then the vanilla extract. In a medium bowl, combine together the flour, salt, baking powder and salt. Slowly pour this mixture into the mixing bowl, mixing between additions. Now, fold in 1/1 of the candy (3/4 of a cup). You can refrigerate the batter for at least 30 minutes prior to baking. 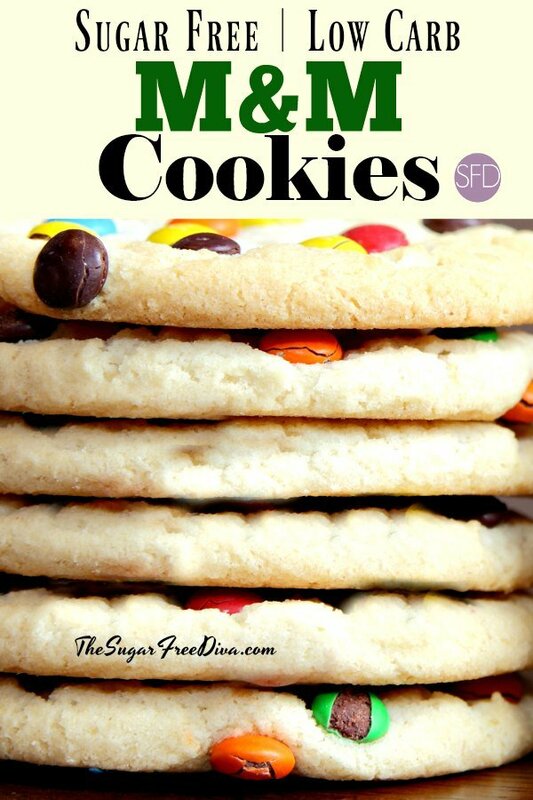 This trick seems to work well with most similar kinds of cookie recipes. If you refrigerate the batter, you can hold off on preheating your oven until you are ready to bake. When you are ready to bake, scoop the cookies on to the cookie sheet(s). Then press the remaining candy into the cookies allowing them to stick out. Bake for 10-12 minutes or until the cookies begin to brown. Allow to cool. Flour AP- 2 1/2 cups. Could you use almond flour in place of the AP flour? 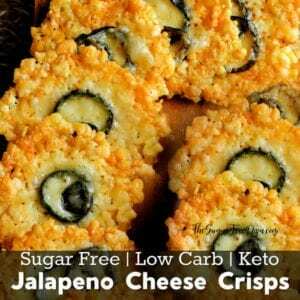 And how many carbs per serving are there in the cookies. These look awesome. Thanks for sharing. Hi. You need to add a binder to the almond flour since it does not have gluten in it. Xanthan Gum is a popular binder to use. Go here to find the nutritional data for recipes. Thank you! !